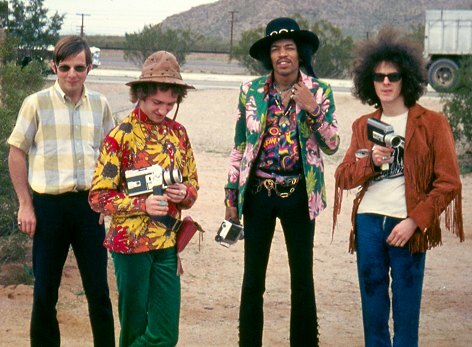 Roger Mayer Mitch Mitchell Jimi Hendrix Noel Redding. Roger Mayer first started making guitar effects in 1964 for his friend Jimmy Page. Jimmy Page, Jeff Beck and Big Jim Sullivan featured these early models on many hit records by various artists as they all played on a lot of sessions and of course their own bands like the Yardbirds. Big Jim Sullivan in fact had two hit record that featured a fuzz box solo "Hold Me" and "Together" both by P.J.Proby Those were the first British records to have that sound. At that time I was working for the British Admiralty in the field of vibration and acoustic research which was all to do with naval underwater warfare in a lab that was next to the National Physical Laboratory in Teddington. My interest in sound and the way it acts has fuelled my career ever since. This scientific background has led me to approach acoustic problems from different angles and I think it is fair to say that most of the effects that I produce have an original and unique flavour. I met Jimi Hendrix first in 1967 in a club and in two weeks time we were in the studio overdubbing the solo to "Purple Haze" using the Octavia that I had invented. My association with Jimi grew and grew at a rapid pace and I spent a lot of time going to gigs and in the studio creating new sounds with him. I was present with him at Olympic studios for nearly all the session for his next album "Axis Bold as Love" and of course you can hear the unique tones I had a part in creating. After recording Axis Jimi invited me to go on the upcoming winter 1968 tour around the states. This was my first trip to the states and after the tour I left the Admiralty and went to work for Olympic Studios building and designing the custom audio devices and consoles that they manufactured for themselves. Studios in those days built their own equipment to gain an edge on the competition. I moved to the States in 1969 and formed my own company, which specialised in Studio equipment. I designed Limiters, Equalisers and complete recording studio consoles that were used by all the top studios in New York and the rest of the world. The success of these studio devices led me to meet many top name artists that I have had the pleasure of working with. I designed and built a great deal of the analogue synthesiser that was used by Stevie Wonder on the albums "Music of my Mind" "Talking Book" and "Innervisions" that were all recorded at Electric Ladyland N.Y.
After working with Stevie I met the Isleys and worked on 8 albums with them. 1978 brought me to Jamaica to meet and work with Bob Marley until he so tragically passed on. The first album for Bob was Exodus were you can hear the sound used both by Bob and Junior Marvin clearly. During this period I was still making mostly studio equipment with the occasional pedals for my friends and famous artists and it was not until the early 80's that the demand and pressure for others encouraged me to reissue the last version of the Octavia that Jimi used. This was the debut of the futuristic looking Rocket casting which did not exist before then. From the death of Jimi until then there were few guitarists with the exception of Ernie Isley and Junior Marvin who were in a position to exploit the realms of new sounds. Jimi's death had left a great gap and disco and Glam rock were kings. The reissue of the Octavia and it's success led me next to put my version of the Fuzz Face the Classic Fuzz in the Rocket Housing and this signalled the start of the Rocket Series that is produced today. The Axis Fuzz was next and then the Mongoose thus completing the series. The Supervibe my update of the Uni-Vibe was produced in a rack mount version. I returned to England in 1989 where I have specialised in making and developing guitar effects. The Voodoo-Series followed by our latest device the Crossroads. My return here to England has led me to meet many of the new and upcoming young guitar players and all I can say to you is it's not over yet. There will be many more new and futuristic effects to leave the drawing board.